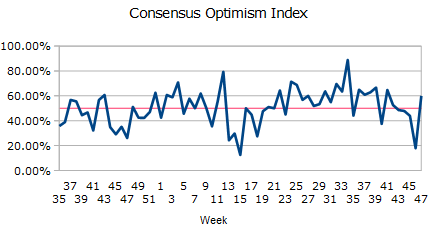 Forex Consensus Optimism Index, 2013, Week 47 | Vision Capital M - Investing With Knowledge. And Style. 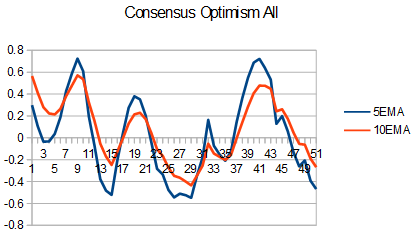 This week’s analysts optimistic expectations are above the middle of the range (60%). This is significantly higher than expectations for the previous week (~18%). Consensuses are more optimistic for the European data (78%) than for the U.S. one (41%), with the positive economic expectations for Europe. increasing faster (406%) than the ones for the U.S. (106%). Positive surprises on the U.S. data could be in favor of the USD due to possibly renewed expectations of FED’s tapering despite the recent dovish remarks of Ms. Yellen. The correlation between the last 4 week change in the overall optimistic expectations and the change in the EUR/USD rate for the respective weeks has been negative for the last six weeks and now stands at -0.62. Generally this would mean that the more optimistic expectations of the analysts are, the more stronger the USD becomes. The following graph would come handy if we decide to further examine a possible relation between analysts’ expectations and the EUR/USD exchange rate. It represents 5EMA and 10EMA of the correlation between the change in consensus optimism for the each of the last four weeks and the respective weekly change in the EUR/USD pair. We see that currently the correlation between the change in optimism and the change in the currency pair is negative (EMA5 = -0.47, EMA10 = -0.27). Moreover, that downtrend seems to continue. It may try to change its direction but currently a positive change in analysts optimism is related to a negative change in the EUR/USD exchange rate. Which comes to show that the current market moves might to a great extent be directed by poitical rhetoric and expectations of tapering or not. Positive data in Europe (higher inflation in particular) would most probably lead to euro appreciation due to possible expectations of tightening of ECB monetary policy while positive data in the U.S. might lead to euro decline towards the USD. The reason here being renewed expectations of a coming FED’s tapering of liquidity. Open your real trading account at FXCM. Or test their opportunities and trading program with a 30 days FXCM demo account. Find out more information about why FXCM is leading the way. dollar, ECB, economic data, EU, euro, forex, forex market, FOREX sentiment, forex trading, fxcm, risk, risk management, technical, technical analysis, usa.